Heartland Men’s Chorus’ pyrotechnic energy and aesthetically decorative production of “ABBA Cadabra” captivated and excited a full house at the Folly Theater on Sunday night. 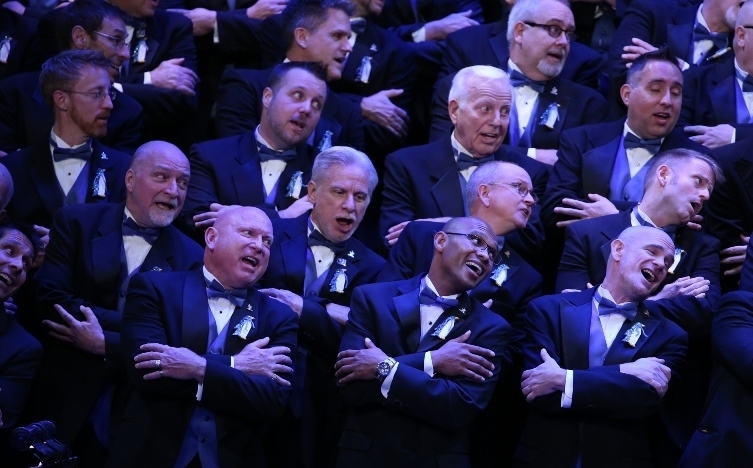 The Heartland Men’s Chorus under the direction of Dustin S. Cates, with pianist Robert Lamar Sims, and a bassist and a drummer presented 17 popular songs of the Swedish pop group ABBA. This show was aurally stimulating with the Chorus’ vibrant and animated singing as well as visually engaging from special lighting effects, dancers on stage, outfit changes, small ensembles, and simple choreography. This concert was split into two parts: In Act 1, the stage was full of rainbow colors from the background and the men’s outfits of all black with colorful ties. The color palate changed for Act 2, and the Chorus wore shades of purple, grey, and black. Act 1 began with a continuous flow of songs: “Super Trouper,” “Waterloo,” “Take A Chance on Me,” “Money, Money, Money,” “The Winner Takes it All/Knowing Me Knowing You,” “On and On and On,” “I Have a Dream,” and “Does Your Mother Know.” The first number, “Super Trouper” featured an acrobatic ring dancer, adding in an interesting visual effect. Five dancers joined the Chorus on stage throughout the whole show in various outfits depending upon the song. The purpose of the dancers was a little unclear, except that they certainly drew attention away from the more basic choreography and moves of the Chorus. And then it became obvious that much of the Chorus wanted to do more moves and dance along to the music, but it is difficult to synchronize a large number of people on more complex motions. Thus the dancers! The balance between the musicians and the Chorus was good overall, although there were times that the musicians slightly overpowered the Chorus and, therefore, words were not easily comprehensible. The arrangements had some interesting harmonies, so it would have been nice to hear more of that. Some highlights from Act 1 include the song “Money, Money, Money” which was sung by eight men who were dressed in costumes of common job uniforms such as a policeman, fireman, mechanic, construction worker, etc. Toward the end of the song they started stripping their clothes off, which naturally aroused and hyped up the audience. “I Have a Dream” began with a quartet of singers who started out a little pitchy, but slowly unified and steadied their harmonies as the song continued. Act 2 began with a “flashy” version of “Gimme, Gimme, Gimme (A Man After Midnight)” as the Chorus members held flashlights in their hands and synchronized movements of shining the lights out into the audience – great effect! The other songs included in this Act were: “Lay All Your Love on Me,” “Voulez Vous,” “The Way Old Friends Do,” “One of Us,” “Fernando,” “Thank You for the Music,” “Mamma Mia,” and “Dancing Queen.” One of the most musically impressive numbers was “The Way Old Friends Do” which started off with a trio of singers with an excellent blend of voices, and they were equally matched by the wonderful harmonies of the choir. Judging by the rest of the show, expectations were held high for the last two numbers, perhaps the most popular songs of ABBA “Mamma Mia” and “Dancing Queen.” “Mamma Mia” lacked some artistic creativity, it was more plain and straightforward, but the presentation of “Dancing Queen” definitely included various special effects and made up for the previous song. Of course a concert full of popular tunes entices people to sing along. The audience was invited to sing on numbers such as “Super Trouper,” “Mamma Mia,” and “Dancing Queen.” Lyrics were projected on a screen that came down from the ceiling of the stage for these songs. And a fun creative activity the Chorus constructed during the show was what they called “ABBA Draga Queen.” Kansas City Drag Queen Melinda Ryder and her husband Kirk Nelson led this event where they took a straight man from the audience and transformed him into a drag queen backstage during the concert and revealed the makeover during the last number “Dancing Queen.” Throughout the show, MC Dudley Hogue along with Ryder came on stage to give the audience updates on the process of the makeover, and even showed some footage of Nelson putting makeup on the “drag-queen-to-be.” Hogue and Ryder were both amusing and entertaining with their comic verbal delivery and adorned demeanor. This event as a whole was a nice addition to the concert and gave the song “Dancing Queen” extra pizzazz – along with the balloons that fell from the ceiling and the ostentatious singing from the Chorus as well as the audience.